Hello, December. According to Caroline, it's now acceptable to decorate for Christmas, listen to holiday music, and read books about Christmas and baby Jesus. And we did all three of those things today. The only thing we missed was sitting in front of the fireplace drinking hot chocolate. Luckily, we still have 23 days to get that done before Christmas. But that doesn't mean that she wasn't upset that it didn't happen tonight. Five year olds are not known for their patience. So now that the holidays are in full swing, does that mean that the pumpkin-everything craze is over? I sure hope not! I much prefer pumpkin spice lattes over the holiday drinks.. and pumpkin-cream cheese muffins still make me pretty happy. 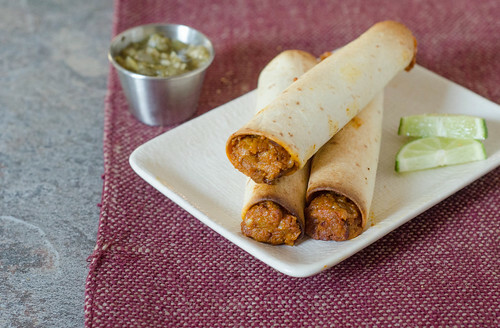 And these pumpkin taquitos. My oh my, are they delicious. The original recipe was for pumpkin taquitos, but I added chorizo. I thought the spicy meat and added texture would work really well with the creamy, sweet pumpkin... big shock: it was a great addition. I mean, to be honest, adding chorizo to pretty much anything will make me happy, but these taquitos were one of my favorite recent dinners. Joey tends to be lukewarm to most pumpkin offerings, but he really loved these (see above comment re: chorizo). They are spicy, but not too spicy, with just a hint of sweetness from the pumpkin. And the crispy, crunchy shell is a great foil to the creamy, cheesy filling. We dipped these in my roasted tomatillo salsa, and everyone loved this meal. So whether you are still pumpkin-obsessed, or firmly in the "No pumpkin past Thanksgiving" camp, think you'll love these. They are quick and easy, can be made ahead of time, and your whole family will love them. Preheat the oven to 425 degrees Fahrenheit. Line a baking sheet with foil and spray lightly with cooking spray, or brush with oil. Heat a large skillet over medium heat. Add the chorizo, and cook, breaking up the large clumps, until it is starting to brown and the fat is beginning to render off, 3-4 minutes. Add the onion and cook an additional 10 minutes, or until the chorizo is cooked through and the onions are soft. Stir in the garlic and cook 1-2 minutes, then remove the pan from heat. Set aside. Meanwhile, in a large bowl, stir together the pumpkin, salt, cumin, chili powder, Greek yogurt, shredded cheese, cilantro, and lime juice. Fold in the chorizo-onion mixture and stir until incorporated. Stack the tortillas on a plate, cover with a damp paper towel, and microwave for 30 second intervals, until they are warm and pliable. Top each tortilla with 3 tablespoons of the filling, roll tightly, and place seam side-down on the prepared baking sheet. Brush each taquito with oil, and sprinkle lightly with salt. Bake 15 to 20 minutes, or until the taquitos are golden-brown and crispy. Cool slightly, then serve with roasted tomatillo salsa. 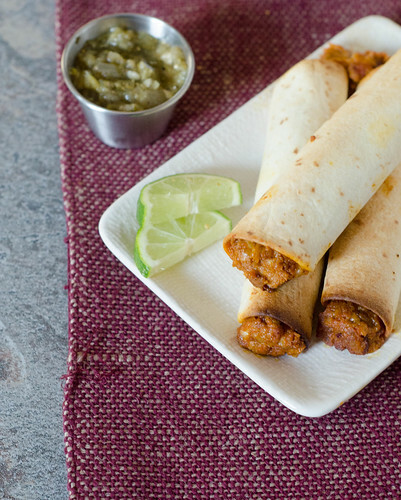 I've been meaning to make these taquitos and the addition of chorizo is genius! I'm going to have to try it with a soy version. Ooo the spice! These look incredible! I'm in the "pumpkin forever" camp, so I'll gladly eat these any time of year. I made this yesterday with Kalua Pig, pepper jack maui onion. It was one of the best pizza's I have ever made or eaten! Mahalo for a great recipe! Now, if I wanted to be unhealthy and have crispy taquitos would you bake them and then fry them? These flew off the platter! Our 'Costco taquito' friends kept remarking how awesome it is to actually see and taste more than a dribble of filling. I should have tripled the recipe. Yay! So glad they were a hit, and thanks for coming back to let me know!